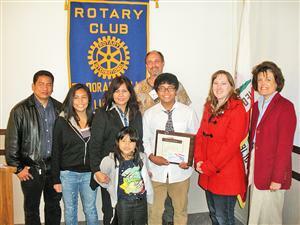 Shawn Nagrampa was honored as the final Student of the Month for the 2010-11 school year. Shawn, his family, teacher and superintendent attended the June 1 meeting, where he received a plaque for his efforts and a $100 savings bond. "In 10 years you can buy a gallon of gas with that," El Dorado Hills Rotary Club President Bill Tobin joked.